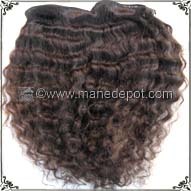 When will you have a certain texture, pattern or length? 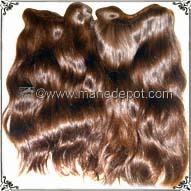 Belorio Virgin South American Hair is not manufactured. Since the hair is collected from individual donors, we are unable to forecast what will be collected and what we will have in our inventory in the future. Can I send you a photo of what I'm looking for? We beat you to it. 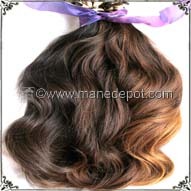 Instead of us trying to match your photo, we provide you the photos to help you select the hair you're looking for. If you do not see the bundles you need now, please check back for new listings. Can you contact me when you have the hair I want? We currently do not compile a notification list for individual preferences. 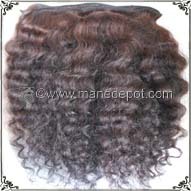 We do not accept payment first and then "make" your order later. We have no set day or time we feature new listings. Notice of new items may occur through our social media channels or newsletter, or these items may be placed in our store without announcement. Please check back frequently for new listings. 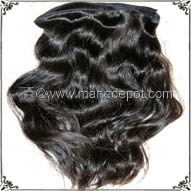 Belorio Virgin Hair origin is South America. Our South American hair is collected as individual ponytails from donors who are compensated to cut their hair for our collectors. 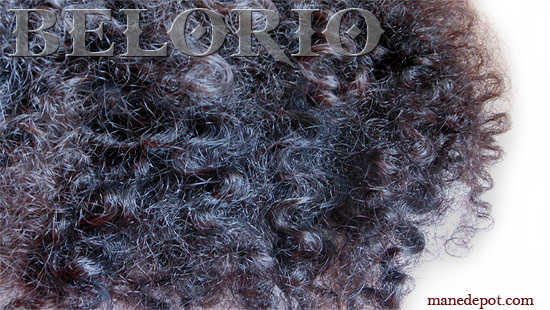 Belorio South American Hair is not a product of China or India nor has it ever been exported from Asia. 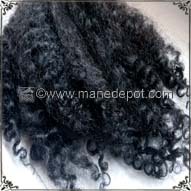 This is genuine, authentic, South American Hair. 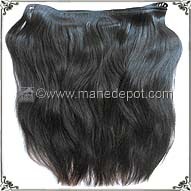 Straight: Hair that is bone straight or may contain slight natural body pattern. 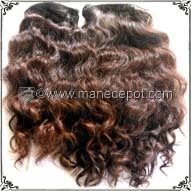 Wavy/Curly: Hair that is body wave, light wavy to curly, only curly ends on wavy hair, or bundles may have a combination of patterns, and finally Molado. 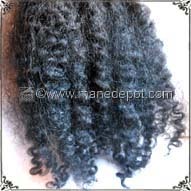 Wavy/Curly category hair does not mean every bundle will have waves and curls together. 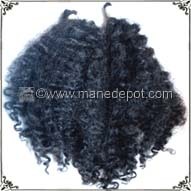 Curly hair is rare and this pattern makes up only a very small percentage of the ponytails that are collected. Ponytails: In the ponytails category, we hand select items to feature. There may be any range of patterns and textures. Some ponytails may be raw, unworked hair we have not opened from their original band when the hair was cut and some may be ponytails we've taken out of their original bands and drawn out the top several inches of short hairs (we refer to this as "the shortest hairs") to prepare it for ventilating, wig making, lace and silk top closure, wefting or making pretipped bonds. Each listing will specify the details. 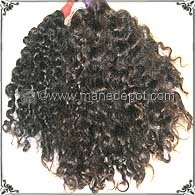 We do not offer "top heavy" ponytails. 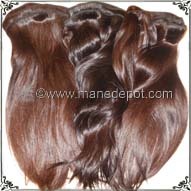 A top heavy ponytail is one where we can predict with certainty by its off balance weight that there is a disproportionate quantity of short hairs near the cutting point. 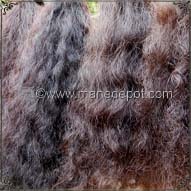 This is what we consider waste hair. 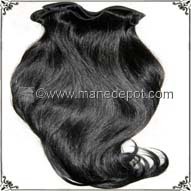 We list only ponytails where we feel the majority of the ponytail can be of use with minimal loss. 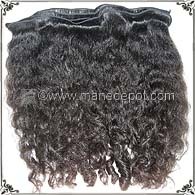 Expect listed ponytails that are unworked to have natural tapering to the ends with all natural growth layers from root to end. 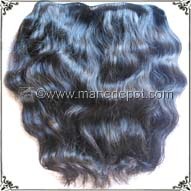 We cannot estimate how much will be lost during tipping or wigmaking because the hair is outside our control. 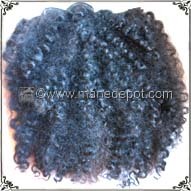 Defining Hair Texture: Hair texture is the diameter of the hair strand and ranges from fine (thinnest strand) to coarse (thickest strand). 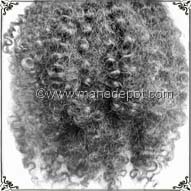 We disclose hair texture in the item's description to meet the anticipated need of wanting a particular texture and we also provide a photo for those who feel texture is not as important as the "look" they're searching for. 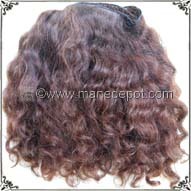 Matching Color Codes: In the categories of Straight and Wavy/Curly machine wefted hair (respectively), matching color dots indicate wefts from that category have been compared together and found to be compatible in both texture and pattern to wear for a single install. 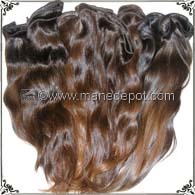 Even with matching color codes, there may be slight differences between wefts and this includes color variations. 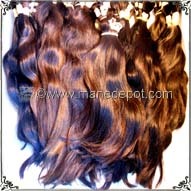 We do not pair up black wefts with medium brown wefts but we will pair up to a one level color difference among wefts. 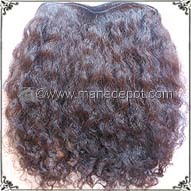 Comment Notes In Your Order: Due to the vast range of our South American Hair, we offer this product in a unique way: The photos of the item is the item being offered. 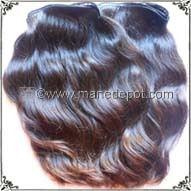 Comment notes are appreciated and welcomed but we cannot change the properties of raw ponytails or bundles or the custom-crafted wefted hair already completed. Cancelations After Ordering: Once an item is purchased, our store is programmed to automatically mark the item out of stock and remove it from view. It is now unavailable to others for consideration. Your purchase is a commitment to that item and will not be canceled or swapped with another bundle. If you have any questions where the answer may influence your commitment to that item, please inquire before completing your purchase. 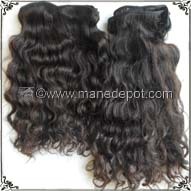 3-5 Days To Ship: Because we have all raw material in stock, we are able to quickly ship after your order is placed. 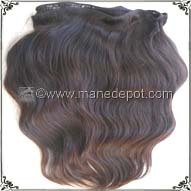 We require several days from the day your order is placed to when it leaves our facility. 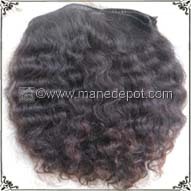 This time is spent shampooing and deep conditioning each weft and allowing a complete air dry. 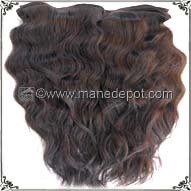 Orders with Express Mail Shipping, your order will still be shipped after this 3-5 day time frame. Is This Hair Kosher For Sheitels? 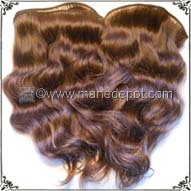 Belorio Virgin South American Hair is B'Chezkas Kosher Hair, meaning it is not rabbi certified but is verified by us through witness of cutting and our collectors as not being temple hair or hair offered through religious ritual. Creating Custom Orders: The most requested textures and patterns are also the least collected so we do not gather personal information for a waiting list. 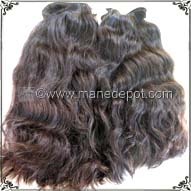 Since this is direct donor cut virgin hair and not manufactured or processed, we cannot predict the amount or types of hair that will be available. Once we have completed items ready, they will be listed in our store. 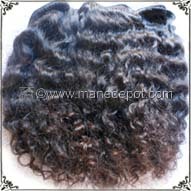 Supplemental Hair For Matching Closures: If you have placed an order on our site for wefted hair and would like us to look through our raw material for bulk hair, please contact us within 24 hours after you place your order. 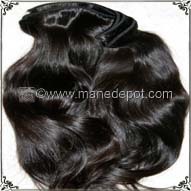 Closures generally require 1.6 ounces (45 grams) of drawn hair. 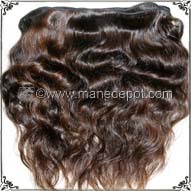 We only search through raw ponytails for hair that will work with the bundle(s) in your order and before your order has shipped. 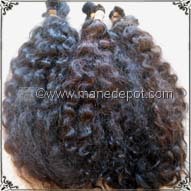 Photos of Hair Not In a Current Listing: Photos we publish here and on social network channels may be newly received ponytail shipments that have a ways to go before being listed, are bundles being prepped for listing, or are of hair that has already been sold. 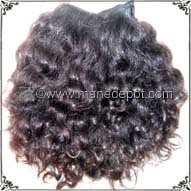 In the event we post photos of hair that is available, we will include a direct link to the item(s) in our store. Photos (like those below) showcase just how unique and diverse our collected South American hair is and represents the quality we provide. 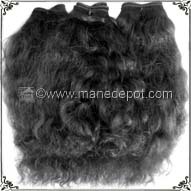 Since all our hair is custom made from individual donor ponytails, we cannot predict when (or if) we'll be able to offer another bundle like it. Keep checking our listings.